Russian earth ionosphere satellite. Ionospheric studies. Used the basic KAUR-1 bus, consisting of a 2. Science, ionosphere satellite built by OKB-10 (NPO Prikladnoi Mekhaniki, NPO PM), Russia. Launched 1969 - 1970. Used KAUR-1 bus. Status: Operational 1969. First Launch: 1969-12-27. Last Launch: 1970-12-02. Number: 2 . Gross mass: 800 kg (1,760 lb). Height: 3.00 m (9.80 ft). Span: 2.04 m (6.68 ft). 035 m diameter cylindrical spacecraft body, with solar cells and radiators of the thermostatic temperature regulating system mounted on the exterior. Orientation was by a single-axis magneto-gravitational (gravity gradient boom) passive system. The hermetically sealed compartment had the equipment mounted in cruciform bays, with the chemical batteries protecting the radio and guidance equipment mounted at the center. Family: Earth, Ionosphere sat, Medium earth orbit. Country: Russia. Launch Vehicles: R-14, Kosmos 3, Kosmos 11K65M. Launch Sites: Plesetsk, Plesetsk LC132/2, Plesetsk LC132/1. Agency: MO, Reshetnev bureau. Bibliography: 2, 4, 449, 6, 12669. 1969 December 27 - . Launch Site: Plesetsk. Launch Complex: Plesetsk LC132/1. LV Family: R-14. Launch Vehicle: Kosmos 11K65M. FAILURE: Launch vehicle failed to orbit - unknown cause.. Failed Stage: U.
Ionosfernaya? - . Mass: 800 kg (1,760 lb). Nation: Russia. Agency: RVSN. Class: Earth. Type: Ionosphere satellite. Spacecraft Bus: KAUR-1. Spacecraft: Ionosfernaya. 1970 December 2 - . 04:00 GMT - . Launch Site: Plesetsk. Launch Complex: Plesetsk LC132/2. LV Family: R-14. Launch Vehicle: Kosmos 11K65M. 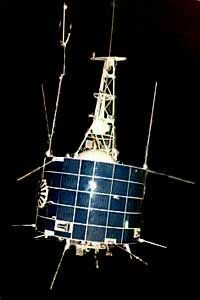 Cosmos 381 - . Mass: 710 kg (1,560 lb). Nation: Russia. Agency: MO. Class: Earth. Type: Ionosphere satellite. Spacecraft Bus: KAUR-1. Spacecraft: Ionosfernaya. USAF Sat Cat: 4783 . 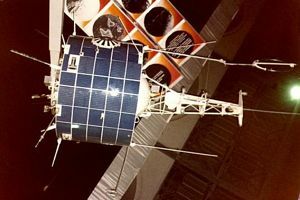 COSPAR: 1970-102A. Apogee: 1,007 km (625 mi). Perigee: 961 km (597 mi). Inclination: 74.00 deg. Period: 104.80 min.